How does the Call Look? Why Mock it at All? Today we walk through the steps required to create a simple REST service without Swagger or any other parsable service description document. For simplicity, the service will have only one response, and that response is static. However, it is enough to understand how MockMotor routing and matching works for REST services, and you can always add more responses following the same steps. We’ll mock DigitalOcean’s Status API. It has only one operation, and it is not protected with any credentials, which makes for an excellent model. And yet it is a real-world and useful service. The response is a JSON payload that contains a few fields the most important of which is indicator which is a short name for “what problems do we have?”. Its value is one of none, minor, major, or critical, and for our simple successful mock it will have a value of none (i.e. no problems). Since the response body is JSON, the response content type will have a value of application/json. 1 It may not be available where you do your coding or testing. I see nowadays many young people like to code while flying on a plane. Or on a beach. While I do not approve that still creates a need for local mock for DigitalOcean API. 2 You may want to create special cases to test how your code works when the API is not available. Later then you can add responses where the Status API returns error codes or times out. 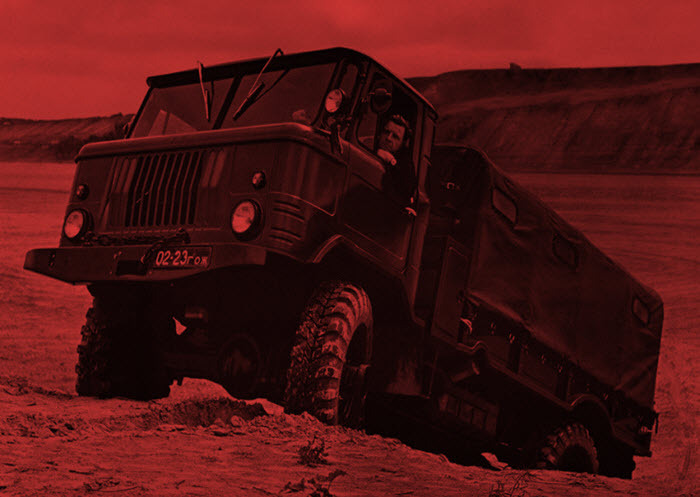 In most cases, we only add mock services to existing environments. 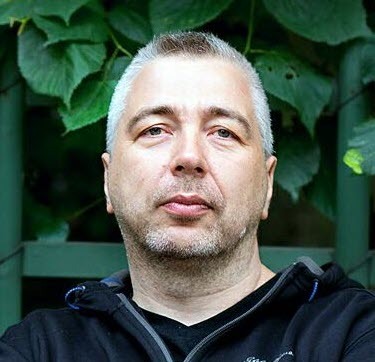 But let’s imagine we have just started a new project - the one that deals with provisioning of servers via DigitalOcean - and so we create a dedicated mock environment for our project. 1 Click on Mock Environments link at the top left part of the screen to navigate to Environments page. 2 Click on Add Environment button to create a new environment. 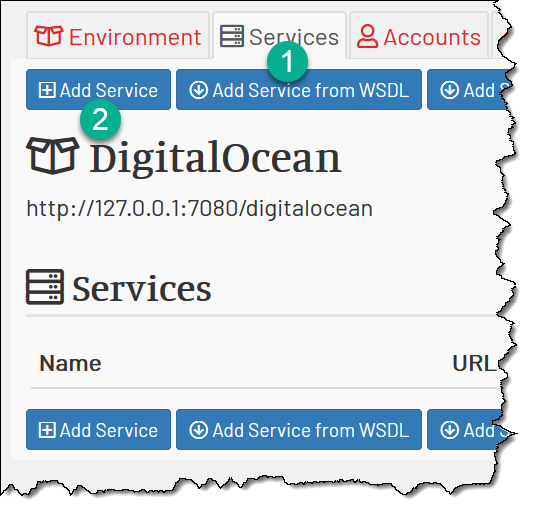 3 Name the environment DigitalOcean and assign it a prefix URL of /digitalocean. If you just created DigitalOcean mock environment, you’re already within it. If you did not, navigate to your environment of choice (DigitalOcean or whatever you use as a playground) by clicking on Mock Environments link at the top left part of the screen, then finding the desired environment in the list and clicking on it. 1 Click on Services tab. 2 Click on Add Service button. 3 Name the service Status and provide the prefix URL of /api/v1. 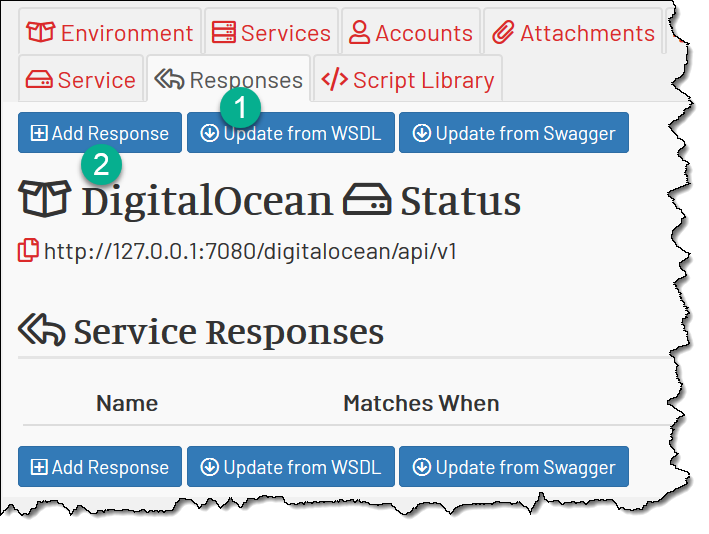 You can notice that the Service URL field is now showing https://127.0.0.1:7080/digitalocean/api/v1 - this is the public URL of your new mock service. 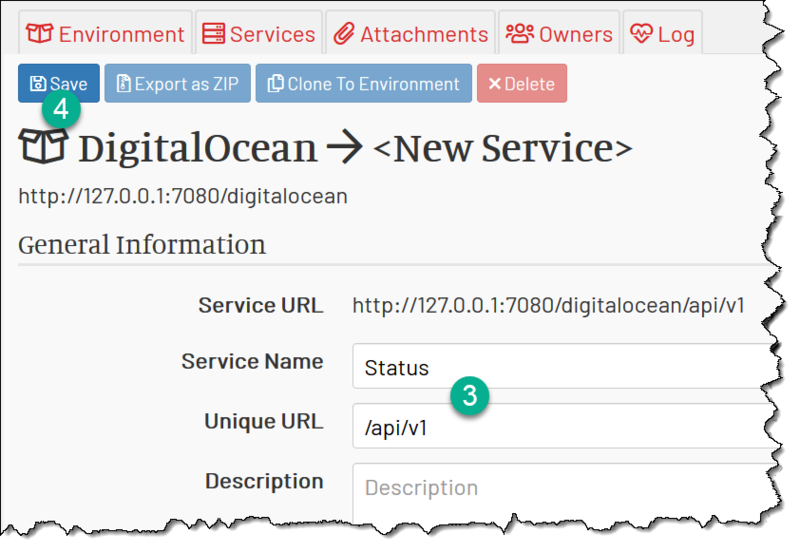 Note it contains the environment prefix /digitalocean following by the service prefix /api/v1. Now let’s add a mock response for the status.json request. 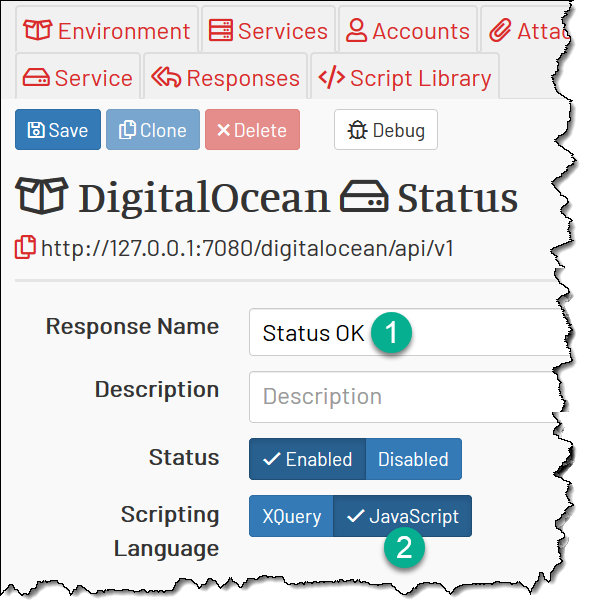 1 Navigate to Responses tab within the DigitalOcean Status service. 3 Enter Status OK as the name for the new response. 5 The request is using HTTP GET, so update the match method to GET. 6 Set operation matching to Relative URI. That means that we match based on the URL, and not say SOAPAction header as in SOAP service. 7 Everything in the request URL after the service URL is the relative URL. In our case it is status.json, so use it as a value to match. 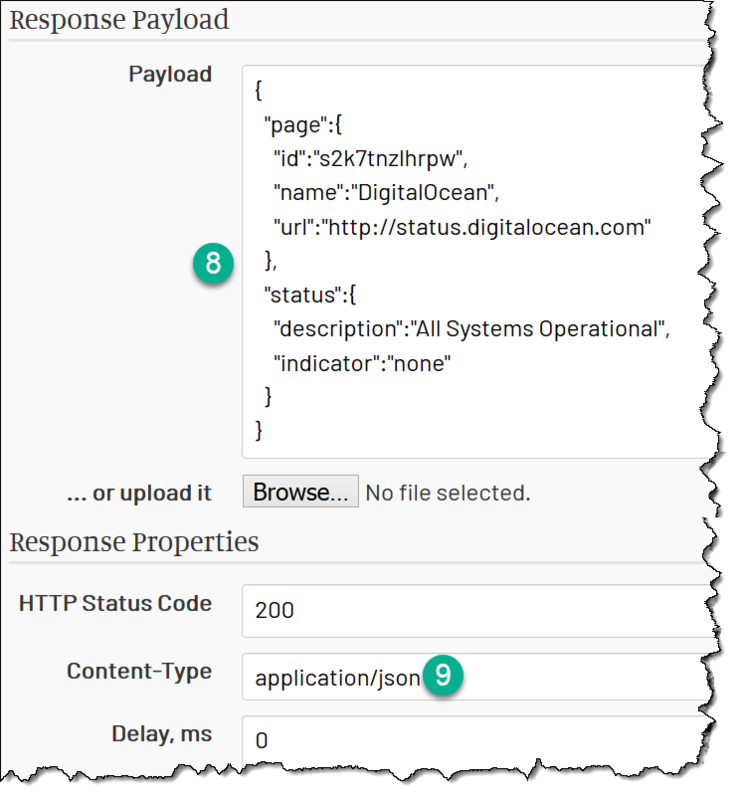 When a HTTP GET for URL http://127.0.0.1:7080/digitalocean/api/v1/status.json comes to MockMotor, it first selects the environment to handle this request. 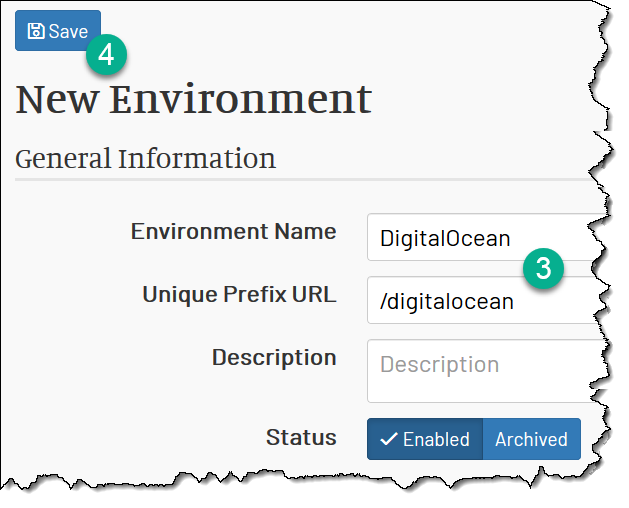 Out DigitalOcean environment has the prefix that matches the first component of URL - /digitalocean. Because of this match, this environment is where the request is routed to. MockMotor then decides what service in the environment should handle the request. The remainder of the URL after we removed /digitalocean part is /api/v1/status.json. The /api/v1 part matches the Status service’s prefix, and so the request is routed to that service. Now we only have /status.json left in the URL. MockMotor reviews all responses within Status service until it finds one that has a full match in Match Options section. 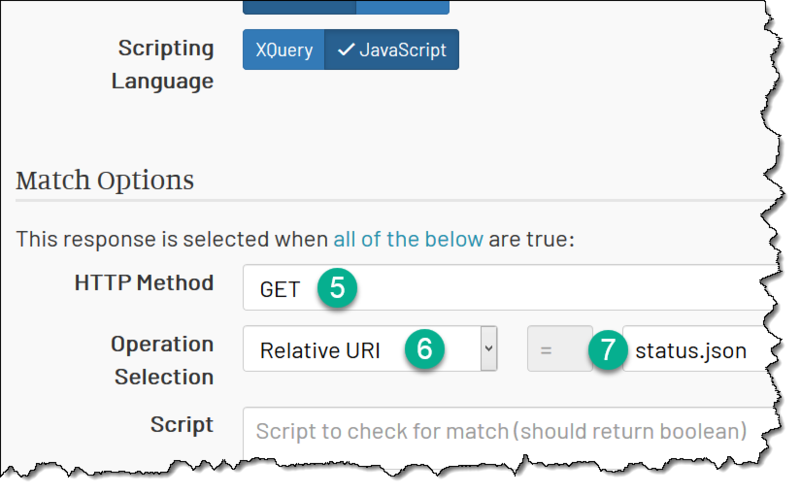 Our mock response says it must match by HTTP method GET (it does) and by relative URL status.json (it does). This response hence is selected and executed. 8 Place the static response into the Payload field. 9 Since the response is JSON, set Content-Type field to application/json. Under Responses tab, you can now see the newly created response with its summary - name, HTTP method, matching options and other details.